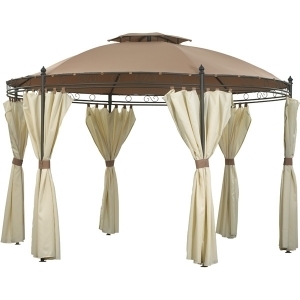 Gazebos are pavilion style structures that can be octagonal, square or turret shaped. They were a common feature of country houses as well as garden or public area features. They can be attached to the house, but are more commonly used as free-standing garden features. The standard styles available to the UK market include inexpensive canvas or material marquees, to more expensive metal strut structures. 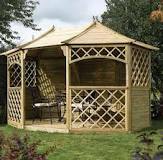 Wooden Gazebos are more expensive but also more permanent garden features. With the good old British weather considered, an outdoor gathering of any description is never a regularly scheduled event. 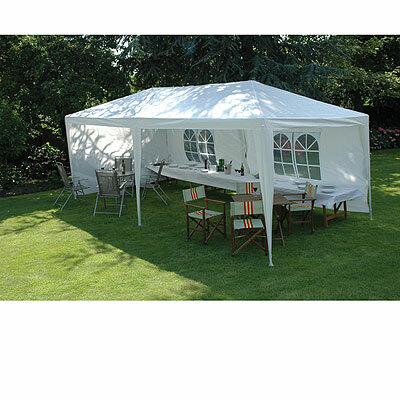 The Party Tent, or small Marquee Gazebo is an ideal budget conscious option. At £255 this Camelot Regency Round Gazebo, in Two Tone Mocha and at an extra large 3.5m in size, is a good value example of the more popular style of semi-permanent Gazebo. The structure can remain and the coverings can be removed for the winter months. 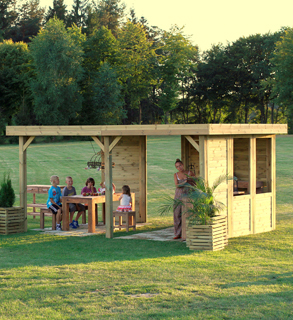 At around £1800, the Sandringham gazebo is an eight sided garden structure that will provide a sheltered place. The trellis will allow for climbing plants. For a similar price to the Gazebo above, this Mayfair Wooden Gazebo is a large 5m x 4m in size and provides an alternative style to the traditional Gazebo. Further scope for additions and walls will allow for future alterations that could turn it into a full garden room.